This training document provides detailed information about the Title, Keywords, and Summary fields in the KB document editor. It includes training exercises that demonstrate the functionality of these fields. For detailed information about other aspects of the document editor, please continue with this training series or return to the KB Author Training - Overview. The maximum length of the title is 200 characters. The title field does not accept formatting (XHTML). Words in the title will automatically be treated as keywords (see below). Keywords do not appear in the text of the document itself. Instead they establish which search terms will return your document when a user submits a search query via the KB search. The image below shows the Search field in the KB User's Guide live site. In the search field is the word "pear". Upon clicking on the Search button, all documents with "pear" in the Title or keywords will appear. Generally speaking, keywords should include product or service names, major concepts, error codes, misspellings, and other words/phrases you might expect users to search for. In coming up with keywords, try to anticipate which terms your users will associate with your documents. The image below is a blank Keywords field in the KB Admin Tools document editor page. Keywords may be separated by commas or spaces. Keywords are not case-sensitive (i.e. if you specify 'pear' as a keyword, your document will appear whether a user searches for 'pear' or 'Pear'). Words in the document title are automatically included as keywords. Your KB administrator can define Default Keywords for your site, which you can insert into the Keywords field using the Show default keywords. The Summary field should provide a succinct description of the contents and/or the purpose of the document. Users should be able to quickly scan the summary to determine if the document is what they are looking for. Depending on the way your KB site is configured, the text you enter in the Summary field may appear in KB search results (another reason to keep it as simple as possible). Although it is possible to alter the appearance of content in the summary using XHTML code, we encourage you to keep the summary as simple as possible. Click on the Documents tab and locate your KB document. Open the document for editing and locate the Title field. 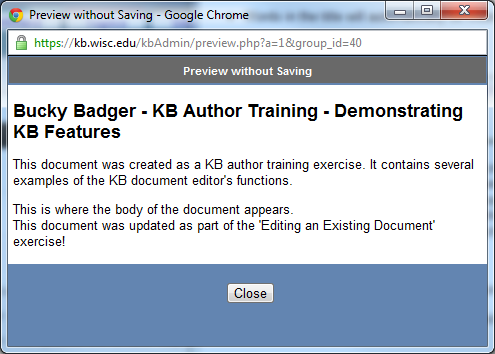 Rename the document something along the lines of: '[Your Name]'s - KB Author Training - Demonstrating KB Features'. This title tells potential users that your document is not a live KB doc; it also describes the function of the document. Click Preview to see the new title displayed on the document. If you are satisfied with the change, click Save Changes. If not, go back to the Title field and make any necessary adjustments. Open the document for editing and locate the Keywords field. Add keywords that a user searching for your document might type into the search window, such as: 'example, demo, KB Admin, editor, body, keywords, summary, field, fields'. Remember that keywords must be separated either by commas or by spaces. If you are satisfied with the new keywords, click Save Changes. If not, go back to the Keywords field and make any necessary adjustments. Once you are done making and saving changes, scroll down to the bottom of the document editor, make sure that the document status is In Progress and click on the Submit. To see the new keywords in action, click the In Progress link on the left-hand menu of the Documents tab. In the Search Term field under the Active Documents heading, enter one of the keywords you just saved (e.g. 'demo') and click on the Go button. Your document should appear in the list that shows up. If it does not, go back to the document editor and ensure that the keyword you searched by is saved in the document's Keywords field. Open the document for editing and locate the Summary field. Enter a summary that reflects the contents of the document, such as: 'This document was created as part of a KB author training exercise. It contains several examples of the KB document editor's functions. Click Preview to see the new title displayed on the document. If you are satisfied with the change, click Save Changes. If not, go back to the Summary field and make any necessary adjustments. After editing the Title, Keywords, and Summary in these exercises, you should end up with a document that looks like this. If your document does not resemble the example, try working through the steps above until you locate the discrepancy.